If you’re artist who is not that into coding (just yet! ), but you still want to create Archimatix Pro (AX) runtime behaviors, well, you can in version 1.0.6 and later! While Archimatix parameters can be exposed to the interface of your model, allowing easy access to them via custom game scripts, you may also use Unity’s built-in UI system or assets like PlayMaker to control the values of AX parameters with the help of an easy to create runtime controller. Let’s jump right into a short example to show rather than tell! While you can control any manner of complex and sublime models you have created in AX using runtime parameters, in this example, we will keep it simple and just adjust the height of a Box at runtime using a UI Slider. 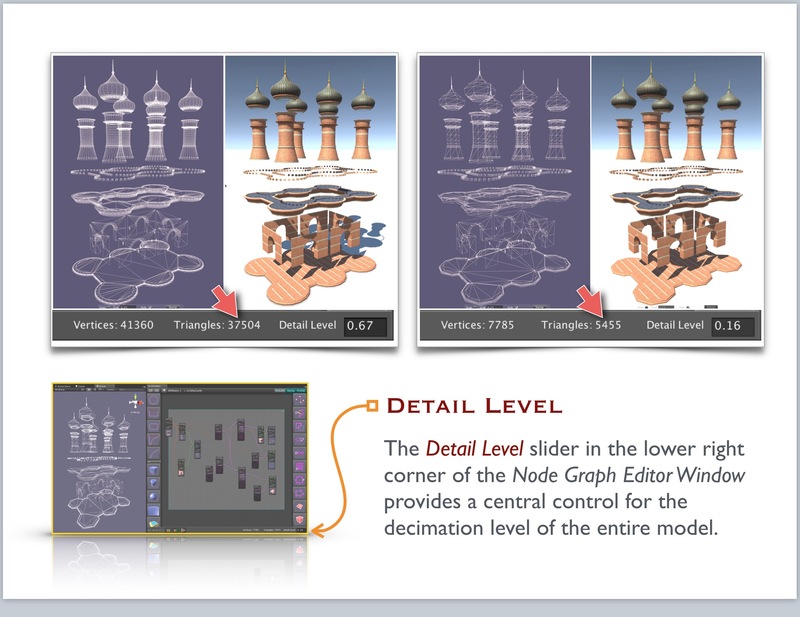 For this example, we won’t eve use the Node Graph Editor. Step 1. 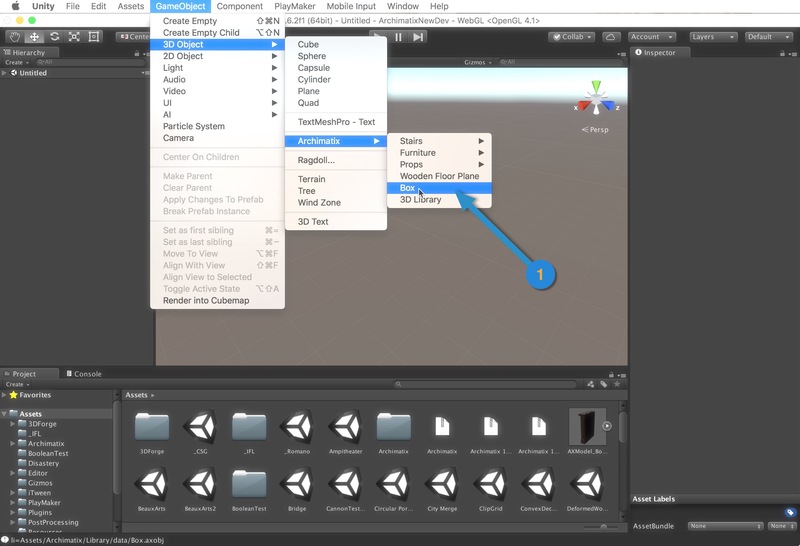 From the Unity menus, create an Archimatix Box. Step 2. Select the Box in the Scene. Step 3. In the Inspector choose to expose the Height parameter as a runtime parameter by clicking the checkbox to the left of the parameter name. Step 4. Note that the Height parameter has appeared in the list of the model’s runtime parameters. 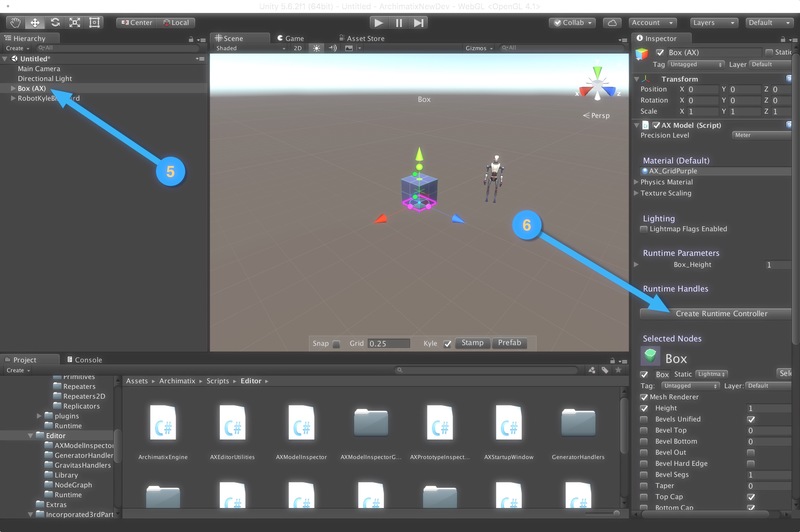 The exposed runtime variables are easy to use in any game script, but they can also be easily made available for binding to Unity’s UI system, PlayMaker, or any other system that connects to dynamic variables. All we have to do is create an AXRuntimeController asset. Fortunately, this is done with the click of a button! Step 5. Make sure the AXModel GameObject is selected. Step 6. Click on the “Create Runtime Controller” button. Step 7. 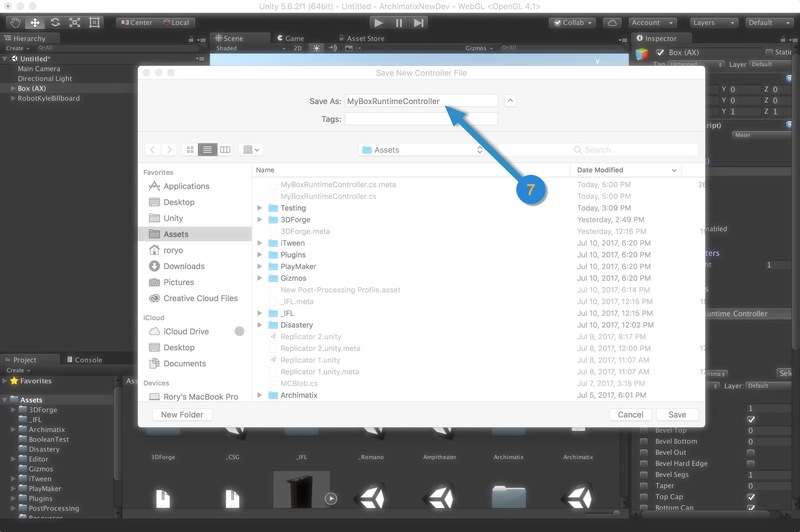 Save the new controller file anywhere in your Asset folder. 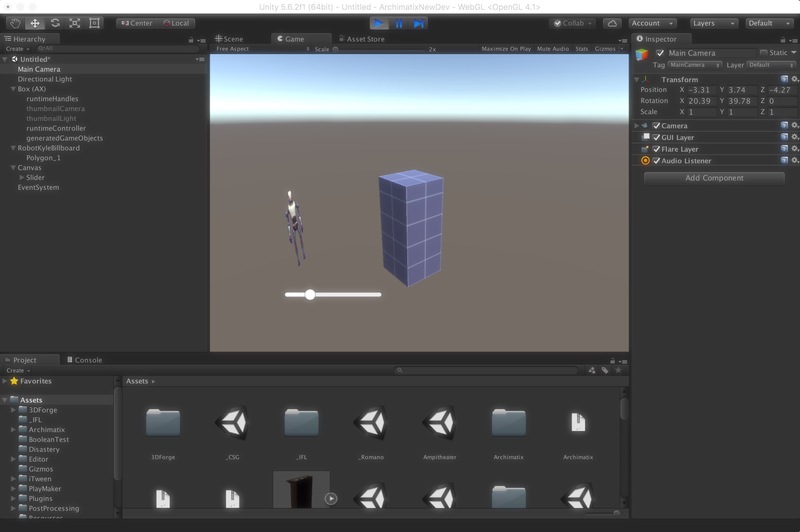 You now have an Asset that connects to Archimatix’s runtime parameters and serves as a source for for Unity’s UI system, PlayMaker, etc. When choosing a connection, use the runtimeController asset you just created as your source of variables. You may not have realized it, but by clicking that button, you 1. created a GameObject in the AXModel hierarchy and 2. added a new component to it, the runtimeController asset you created. If you select other parameters in your AX model to become exposed as runtime parameters, just click the “Create Runtime Controller” button again. This time it will not ask you to locate the file, but just overwrite the one you have already created. 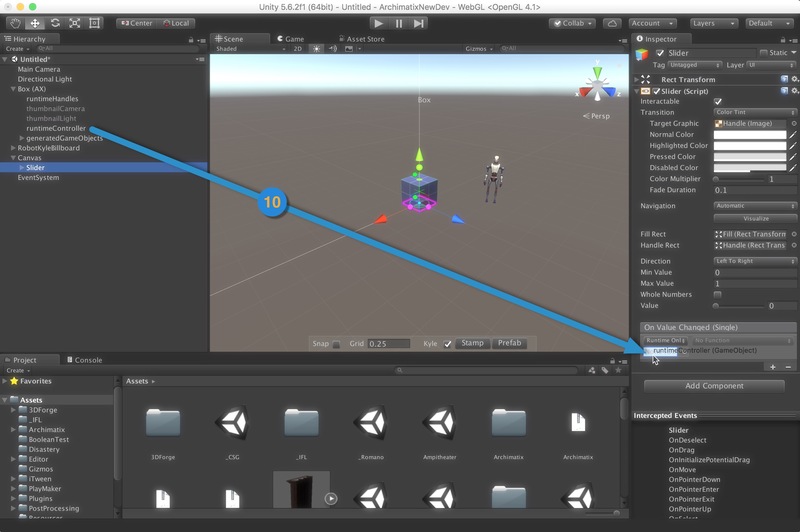 Now let’s take a look at how we can connect your new controller to Unity’s UI. Step 8. 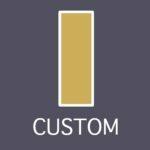 Create a UI Slider. Adjust its Max Value to 10. Step 9. Add an Action to the Slider. Step 10. Unfold the Box model, click on the Slider in the Hierarchy and drag the runtimeController to the ObjectField in the Slider Inspector. Step 11. For the Function pulldown in the Slider Inspector, choose your controller and the Box_Height variable. By Jove! You’ve done it again! 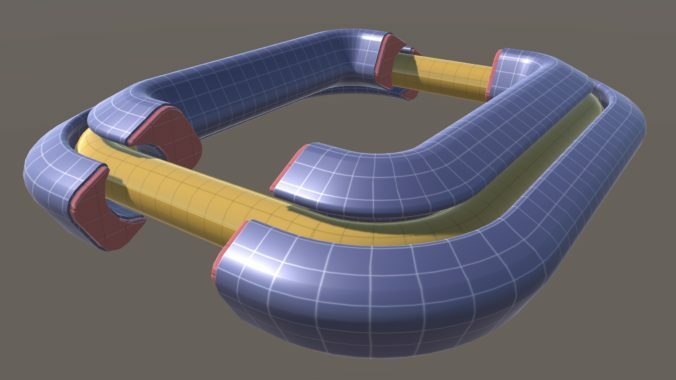 You have just empowered your game interface to do runtime modeling! Check it out! Step 12. Check your UI to make sure the Slider is visible in the Game View. Click Play and manipulate the Slider. The Box height should be adjusting as you move the Slider. 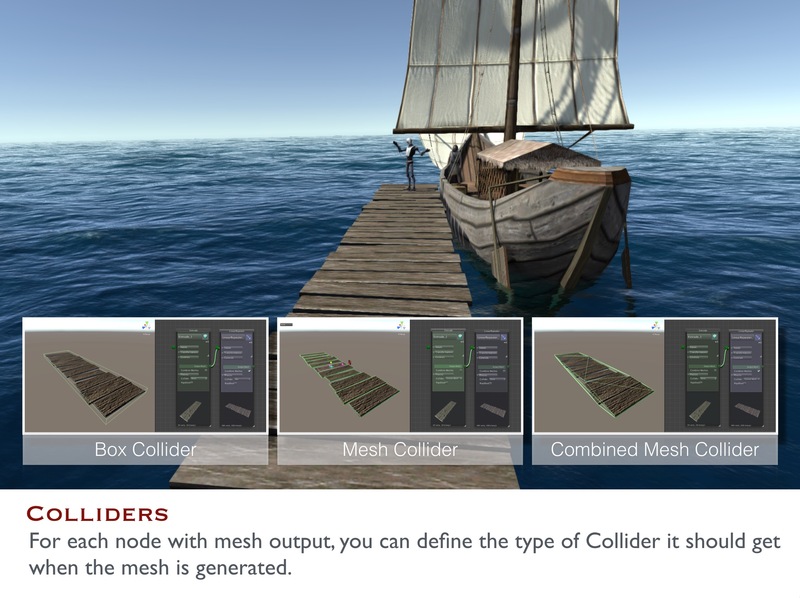 Archimatix lets you specify the type of Collider you would like on the GameObjects that it generates. 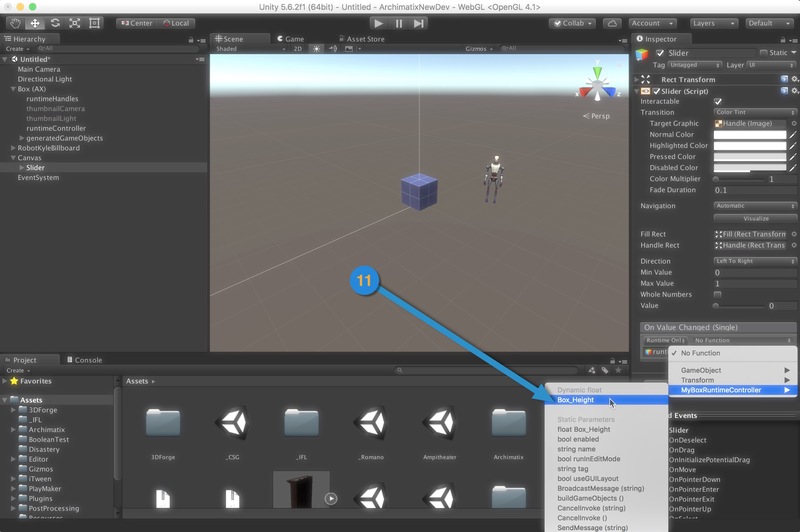 All of the Unity Colliders are supported. In order to have a collider automatically enclose a series of meshes, in the node palette you can specify that all of the individual meshes being output are combined. 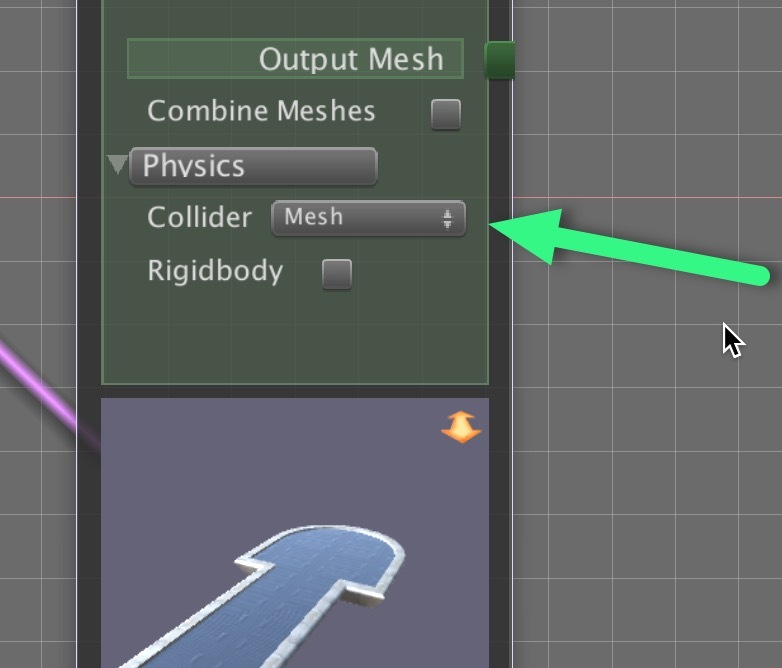 Archimatix also lets you use meshes as colliders only, by letting you specify that the mesh should not have a Renderer attached. Runtime Archimatix is available in version 1.0.5 -full documentation coming soon! 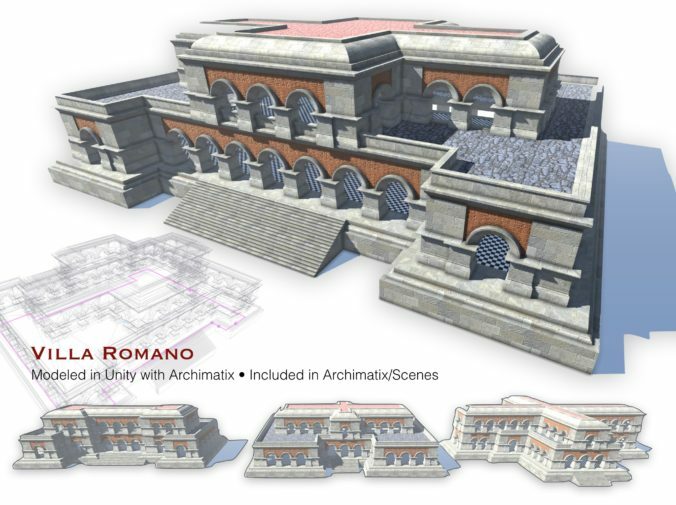 With Runtime Archimatix available only in Archimatix Pro, you can create in-game interactive modelers of your own design. 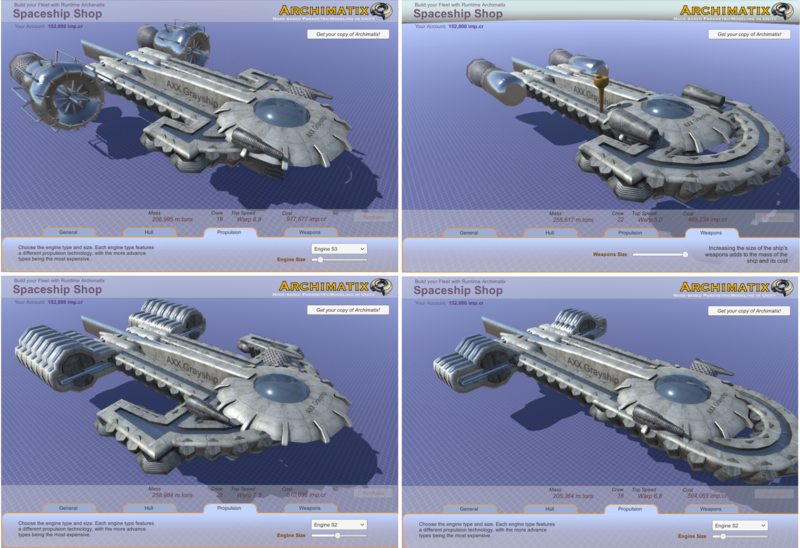 A good example is the Spaceship Shop demo scene included in Archimatix Pro. In this demo, you can use the in-game UI to deliver simple modeling functionality, such as changing the shape of the hull with runtime handles, choosing the engine type and size, as well as sizing and positioning the weapons. Such a shop could be part of a game or its own independent application. 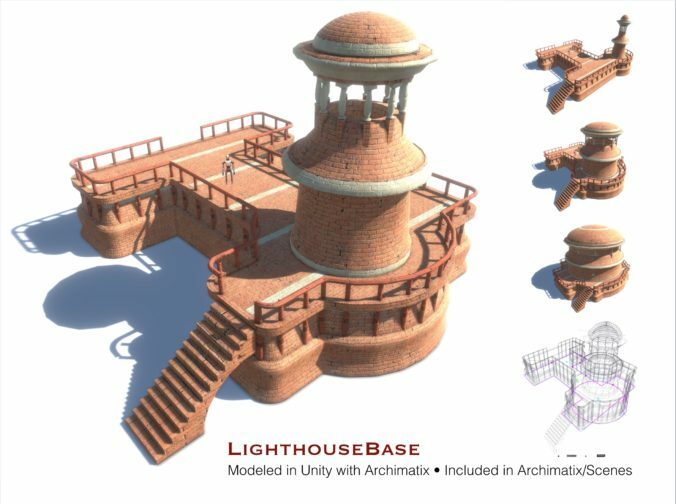 Other examples might include in-game house construction, maze design and, well, anything you can dream up! By creating such runtime applications, you not only make environment and prop building simple, fun and thematic, but also generate opportunities for in-app purchases that go beyond the acquisition of modular inventory items. In its first iteration, runtime Archimatix (AX) allows you to control AX parameters from your runtime scripts. 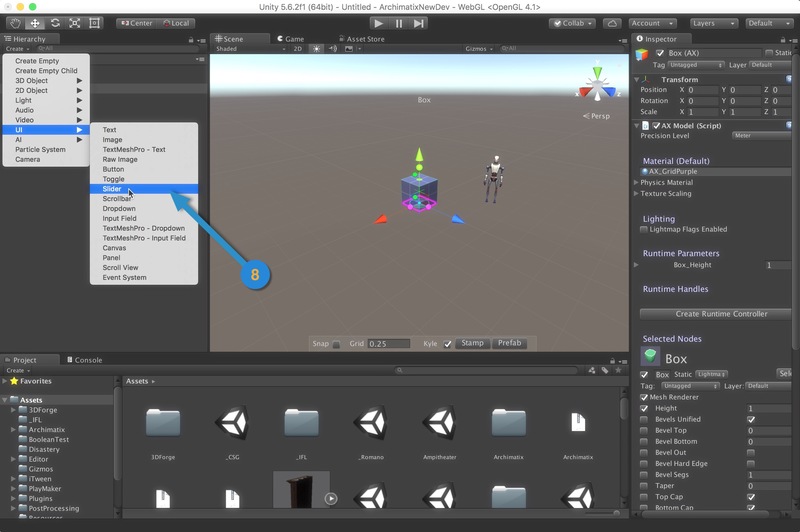 This means that you can connect your runtime UI to an AX model and control it in a way that works with your game design. For example, if your player can spend game dollars to build a house, then they can size the house interactively while watching the cost of the house vary with the floor area of the building. To facilitate this, AX has an “Expose” checkbox under each parameter in the node palette. Once you check that, the parameter will be displayed in the Inspector for the AXModel. With the variable exposed at the model level, your script can easily access the variable to get and set its value. After doing this, you can drag the AXModel aGameObject into the ObjectField in your runtime script. With this reference to the parametric model, you can get and set the parameters that you have promoted put to the model interface. When you set these parameters, they will ripple their value change throughout the graph based on the Relations you have established between parameters. // Establish refernces to AXModel parameters. To modify the parameters you have a reference to, use AXParameter.intiateRipple_setFloatValueFromGUIChange(floats value) and then let the model know you are ready to have the changes regenerate the model while dragging with model.isAltered() or after UI edits are complete with model.autobuild(). // Example of a UI callback function. This could be a delegate of a Slider that controls the radius. // but not necessarily to create new game objects. // isAltered() is often called during a repetitive change such as with a slider. // Tell the model to rebuild its GameObjects. // autobuild() is often called after a Dropdown or Checkbox UI is modified. That’s all that you need to get started with runtime Archimatix! There will be full API published eventually as well as some example scenes. 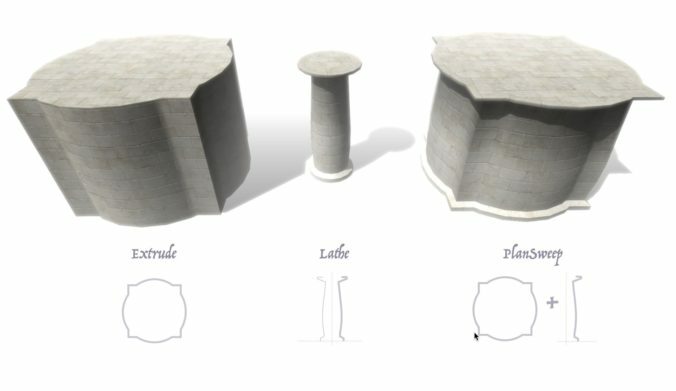 Since Archimatix is a non-destructive modeler that gives you great control over detail level, you can iteratively reach the optimal triangle efficiency versus aesthetic richness you would like for your model by simply dragging local parameters in the nodes or the global Detail Level slider. Triangle density tends to be a product of 2D Shape segmentation. You can set the segmentation of Plan and Section shapes to control the number of triangles in the meshes generated by the shapes. As you model, if you think certain forms look too faceted, you can go to their generating shapes and up the segs parameter. Alternatively, you can use the Detail Level parameter at the lower right hand corner of the Node Graph Editor to decimate segs variables where ever they are found in the graph. You can also use this detail control to create LOD version of the model. Eventually Archimatix will have an LODGroup creator. A great way to extend Archimatix is to create your own node to work with other nodes in the graph. While you can create your own node by saving a graph you create to the Library or by creating a custom parametric Shape using AX Turtle scripting, you have the most power and flexibility to change the course of AX history by coding a node in c#. Fortunately, its not that hard to create a node. All you have to do is derive a class from one of AX’s Generator classes. Most commonly, you will subclass Generator2D or Generator3D. You only need to override a couple of functions and, voila, you have created a custom node. Your script file and icon file can be anywhere in the project’s Asset folder your new node will be discoverable by AX. The only requirement for discoverability of your class is that, in addition to subclassing a Generator, you need to implement the interface ICustomNode. AX uses this Interface to search for custom node classes. While your node icon can be anywhere in the Asset folder, it will be discoverable only if you name the icon image file according to the convention zz_AXNode-MyNodeName.jpg and place it anywhere in the Asset folder, your node will appear in the right sidebar menu of the node graph window, toward the bottom of the menu. If you don’t create your own node icon image, one will be automatically displayed for you in the right sidebar of the node graph. AS a generic icon, the only way a user will know that it creates an instance of your node is by the tool tip that appears when you mouse over it. For this reason, it is probably best to create your own distinctive look! Your node icon image should be square and saved as a jpg file. If you have named your image file according to the convention above, then it will be displayed in the sidebar at 64×64 pixels so your original image file should be that size or larger. In order to work contextually with the other nodes in the sidebar color-wise, you can use the blank image icon to the right as a background. Once your image is saved, select it in your Unity Project window and, in the Inspector, set the Texture Type to Editor GUI. A custom node written in C# is really just a subclass of a AX.Generator. A Generator has inputs, parameters, generative logic and outputs. The inputs may be Shapes, Meshes, Prefabs, or the output of any AX node. You can determine what output parameters you would like to provide for. A Generator gives a node a behavior. The actual node class itself is AXParametricObject, which subclasses AXNode. Before going too deeply into the structure of AX, lets look at an example of what a Generator subclass might look like. To get started, duplicate Archimatix/Scripts/Core/Generators/CustomNodeTemplate.cs. Change the node name, and edit the generate function and you have your own node! In addition to SceneView Handles, you can also create custom GUI to insert into the node palette. 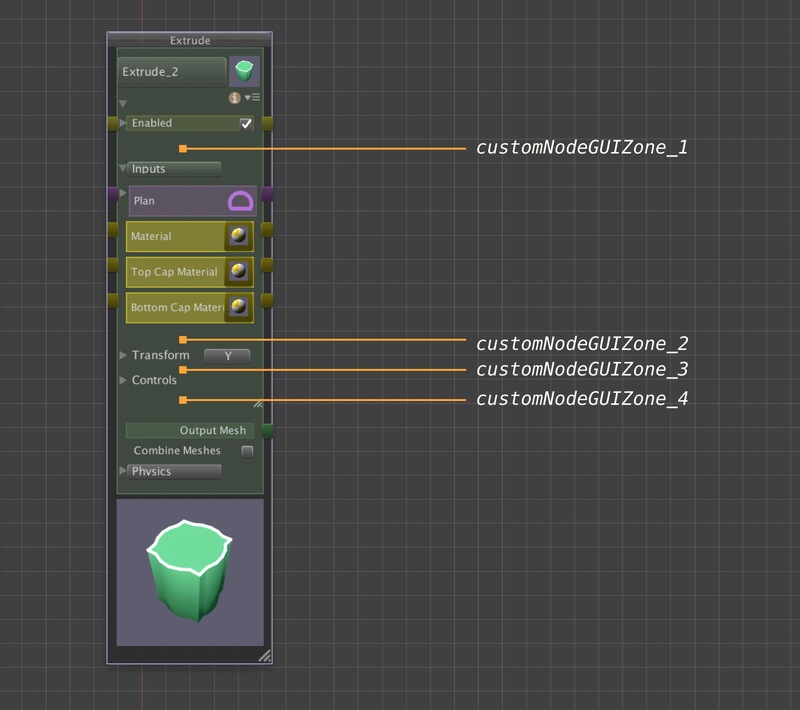 There are four zones in the node palette which are controlled by GeneratorHandler functions you can override. The four zones are depicted in the following diagram. To add GUI elements to your custom node palette, override one of these four functions. The current y-value for the GUI zone is passed into the function. You must keep adding to this cur_y and return the final value for cur_y at the end of the function. The function may initialize variables to help with layout of the EditorGUI elements. Textures are often thought of in two ways. Either tiled textures that can repeat indefinitely with no apparent seams or texture atlases, where a region in the texture image is exclusive to a polygon in the mesh. RoaringMac on Steampunk Made Easy!